Healthy Byte: TV Shows Fanning the Flames or Helping? Personal Note: A lot of overeating or poor eating choices revolves around one’s psyche and ta person’s own emotional relationship with food. Just because these trainers purposely gain weight it doesn’t necessarily change their personal state of mind in regards to food. For example, if their innate mindset is that food is nothing but fuel for their body then it is quite different from someone who has an emotional attachment to say ice cream when they are upset about something. So although this may allow trainers to be more compassionate towards clients but I wouldn’t say that their journey is anywhere equivalent to someone who is actually obese, overweight, or have grown up with grandma giving them a fresh bake cookie when they’ve had a bad day. Just something to keep in the back of the mind anyways. 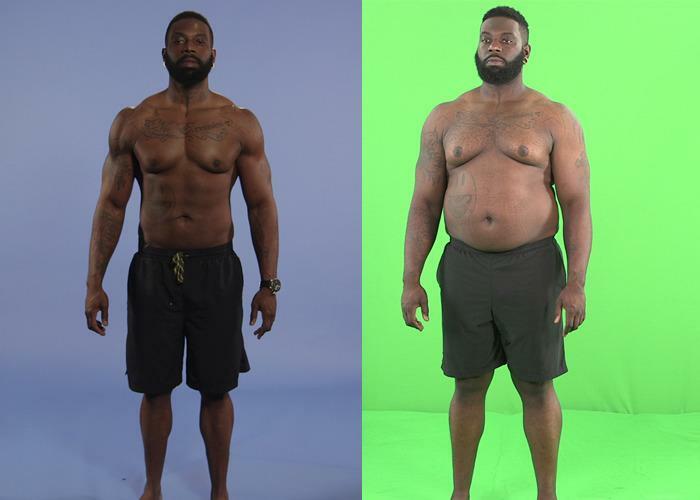 In the new A&E show Fit to Fat to Fit (premiered Jan. 19), trainers don’t just preach the powers of diet and exercise, they live it with their clients — by throwing their healthy lifestyles out the window, upping their body weight by 40 percent, and then working side-by-side with overweight people to shed pounds together. But is gaining excessive weight over the course of four months only to lose it again (in four months) healthy? Experts warn against it: “It’s certainly not healthy to put weight on at all, but it’s also not healthy to put weight on really fast,” Charlie Seltzer, MD, a weight-loss expert and Yahoo Health Advisory Board member, tells Yahoo Health. When you eat this way, you gain fat, not muscle mass, says Blake. This can put you at risk for obesity, which ups your likelihood of suffering from a health condition like hypertension or diabetes. Seltzer adds that a bigger waist circumference — which comes hand-in-hand with weight gain — is linked to cardiovascular disease, a decrease in insulin sensitivity (associated with diabetes), more triglycerides in your blood (a type of fat that can increase your risk of heart disease), and an increase in the “bad” LDL cholesterol. The worst part: “These issues don’t necessarily easily reverse themselves when you get back to normal weight,” says Blake. Beyond the physical side effects, though, if you gain weight in such a manner, you start to train your body to want more food, says Blake. Part of that comes down to the way your stomach stretches; part of it is your body learning new (unhealthy) ways of operating. And these habits, she says, take time to nix, too. While Blake notes that if you’ve been in excellent shape your whole life (like the trainers), you’re much more likely to be able to bounce back to a healthy weight fairly quickly, actually doing so is not always so easy. Seltzer says that without an extensive fitness and physiology background, it’d be hard for the average person to see similar weight-loss results. “It’s so hard to do it right anyway,” he says. If you’re trying to drop pounds within a certain amount of time — like on the show — it’s even harder, he says, as specific factors like meal timing become especially important. There are also dangers to trying to do so. Physically, when you lose weight quickly, you lose more muscle mass and miss out on crucial nutrients because of the giant calorie deficit, says Seltzer. Your body can also go into starvation mode, says Blake. In this kind of state, your metabolism can be compromised. “Your body starts to ‘hang on’ to calories,” she says. If this happens, it could mean that to maintain a 150-pound weight that you once had, you might need to eat less than you once did. In fact, trying to move the scale quickly is usually never a good idea. Seltzer says that the faster you lose weight, the more likely you are to gain it back. In part that’s because — in the real world — when people drop pounds too fast, they tend to ignore the underlying issues that made them overweight to begin with. And for those of us who aren’t in front of the camera, addressing those issues in due time with the appropriate support is the best and healthiest way to attack weight loss.